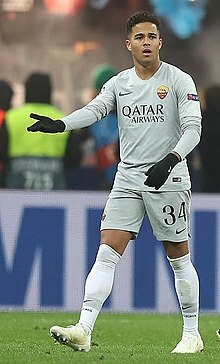 Justin Dean Kluivert (born 5 May 1999) is a Dutch professional footballer who plays for A.S. Roma and the Dutch national team. He primarily features as a left winger. Born in Amsterdam, Kluivert came through the AFC Ajax youth program and had his first professional contract with Ajax. He made his Eerste Divisie debut with Jong Ajax on 16 September 2016 in a game against MVV, replacing Vince Gino Dekker in the 67th minute, in a 1–0 away loss. He also played in the 2016–17 UEFA Youth League, in which he scored in a 2–0 group stage win at PAOK on 2 November. Kluivert made his first team debut in the Eredivisie on 15 January 2017 in a 1–3 away win against PEC Zwolle, when he replaced Amin Younes in the 39th minute. He scored his first Eredivisie goal on 19 March in an away match against SBV Excelsior, exactly 10 years and 1 day after his father's last career goal. The match ended in a 1–1 draw. He made six appearances in the 2016–17 UEFA Europa League, and was an unused substitute in the final, a 2–0 loss to Manchester United in Stockholm. On 26 November 2017, Kluivert opened his account for the season with a hat-trick in a 5–1 home win over Roda JC; his father never scored a hat-trick in the Dutch league. On 12 June 2018, Kluivert moved to Italian club A.S. Roma, following a telephone call made by Roma legend Francesco Totti to his father, for €18.75 million. He chose the number 34 shirt number at Roma as a support for his good friend and former teammate Abdelhak Nouri who wore it at Ajax; Nouri suffered a career-ending cardiac arrhythmia attack in 2017. Kluivert became the youngest Roma player to score in the UEFA Champions League after scoring the fourth goal in 5-0 home victory against Viktoria Plzeň on 3 October 2018. It was his first goal for the Giallorossi and he dedicated it to Nouri. On 16 December, he scored for the first time in Serie A in a 3–2 home win over Genoa. At the 2016 Under 17 Euros held in Azerbaijan, Kluivert played throughout the tournament in which the Netherlands reached the semi finals. Kluivert earned his first full international call up in Ronald Koeman’s first Dutch national football team squad in March 2018 for the friendlies against the England and Portugal. He made his senior debut on 26 March, in a 3–0 win over the reigning European champions Portugal, at the Stade de Genève, replacing Memphis Depay for the final 12 minutes of the match. Justin Kluivert is the son of former Dutch international football player Patrick Kluivert and grandson of former Surinamese football player Kenneth Kluivert. He is also of Curaçaoan descent through his paternal grandmother. ^ Luckhurst, Samuel (8 March 2018). "Justin Kluivert finally reveals what Man United manager Jose Mourinho told him". men. Retrieved 16 October 2018. ^ "Justin Kluivert leaves Ajax for AS Roma". mid-day. 23 June 2018. Retrieved 16 October 2018. ^ a b "Netherlands - J. Kluivert - Profile with news, career statistics and history". Soccerway. Retrieved 17 September 2016. ^ "Justin Kluivert". Ajax.nl (in Dutch). ^ "Justin Kluivert (16) tekent contract bij Ajax". nos.nl (in Dutch). 29 April 2016. Retrieved 17 September 2016. ^ "Ajax signs contract with Justin Kluivert". ajax.nl. Retrieved 1 July 2016. ^ "MVV Maastricht vs. Jong Ajax - 16 September 2016". Soccerway. Retrieved 17 September 2016. ^ "Ajax A1 boekt overtuigende Youth League-zege bij PAOK". FC Update. 2 November 2016. Retrieved 8 January 2019. ^ McNulty, Phil (24 May 2017). "Ajax 0–2 Manchester United". BBC Sport. Retrieved 8 January 2019. ^ "Justin Kluivert scores hat trick as Ajax thrash Roda JC". ESPN FC. 26 November 2017. Retrieved 26 November 2017. ^ "Serie A - Calcio: Roma sign Ajax winger Justin Kluivert". MARCA in English. Retrieved 12 June 2018. ^ "Kluivert honours Nouri with Roma shirt number choice". Goal.com. ^ Ciaran Varley (8 January 2019). "The touching reason players are wearing the number 34". BBC. Retrieved 9 January 2019. ^ "KLUIVERT AIMING FOR MORE AFTER BECOMING ROMA'S YOUNGEST UCL GOALSCORER". www.asroma.com. ^ "Football news - Justin Kluivert dedicates first Roma goal to former team-mate Abdelhak Nouri". Eurosport. ^ "Soccer-Relief for Di Francesco as Roma fight back to beat Genoa". Reuters. 16 December 2018. Retrieved 27 December 2018. ^ "Netherlands U17's defeated in Euro semi-final". Football Oranje.com. ^ "Chong to the fore as Netherlands edge Sweden". UEFA. ^ "Ajax's Kluivert Jr relishing career challenge". UEFA. ^ "Justin Kluivert: Leuk om met mijn vader vergeleken te worden". Het Parool (in Dutch). ^ Labellarte, Giuseppe (22 March 2018). "Ronald Koeman urges Justin Kluivert to remain in Dutch Eredivisie". Sports Mole. Retrieved 26 March 2018. ^ "Cristiano Ronaldo and Portugal suffer heavy defeat by Netherlands". The Guardian. Reuters. 26 March 2018. Retrieved 26 March 2018. ^ "Kluivert Jr. geniet van debuut: 'Echt een topgevoel'". VI (in Dutch). 16 September 2016. Retrieved 17 September 2016. ^ "Ajax's Justin Kluivert wants to be the best and not just famous for his dad". The Guardian. ^ Smith, Chad (19 August 2017). "THE RISE OF FOOTBALL IN CURAÇAO AND THE INFLUENCE OF PATRICK KLUIVERT". These Football Times. Retrieved 8 January 2019. ^ "2016/17: United win it for Manchester". UEFA. 30 May 2017. This page was last edited on 17 April 2019, at 15:19 (UTC).